A common complaint about Ron Howard's "How The Grinch Stole Christmas" is that the movie was dreary, mean spirited, and overtly sexual. While I will give the haters credit on that last one, the original Dr. Seuss book was a bit of a downer itself. It was strange and hopeful, yes, but that is to ignore the fact that the Grinch himself was a mean spirited individual who stole Christmas for the mere fact that he didn't like the joy or noise. Ruining a whole town's fun brought him pleasure because he saw the whole thing as frivolous, and you sense he wanted to prove to them that they would be as miserable as he was so long as he took their gifts away. Ironically, my church is going through the Book of Job, in which Satan makes a similar claim about a man who wouldn't be so righteous if his good fortunes were to suddenly vanish. Long story short: Satan makes a similar bet with God that he ends up losing. It's a classic story that has worked for year, but Illuminations animated remake "The Grinch" feels too sugary and non-confrontational for the message to really hit home. 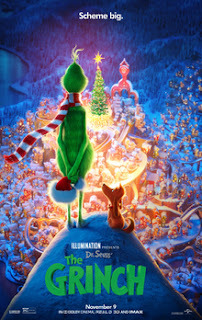 For the Grinch (Benedict Cumberbatch) in this film is an outcast to society by his own doing. He isn't someone who hates Christmas with a passion so much as he just happens to be someone who doesn't have anyone to spend it with, and so seeing other people enjoy it makes him miserable. In all fairness, there are flashbacks that hint that the Who's in town failed to invite him into their lives, and it is a subplot that has the potential for a rich emotional payoff. After all, no one likes to see a child alone on Christmas. I suppose my confusion lies then with why he remains alone for so many years after the fact. In this movie the Grinch seems to actually socialize with the Who's to the point where he buys his groceries from them. They wish him Merry Christmas and are openly nice even when he is predictably mean. There's even a Who in Whoville that seems to be under the impression that the Grinch is his friend (and considering some of the banter that takes place, it could be argued they are). For that matter, The Grinch is openly nice to his dog Max, and is sympathetic to a sidekick character created exclusive for this movie: Fred the Moose. It's all done in such a way that I questioned if The Grinch was even all that Grinchy to begin with. Sure, he had a lonely childhood, but that set up requires a more nuanced film than what Illumination is willing to give us. Their bread and butter are movies that include bright colors, fast movements, and characters to make plush dolls out of (which may even explain why attempts were made to make the Grinch himself look as cuddly as possible). Give Ron Howard credit: While he may have missed the mark, his adaptation flushed out the Grinch's back story in a much more substantial way to justify being two hours long (this movie barely cracks an hour and a half). If it seems like I am sour on "The Grinch" at this point, this isn't the case. No, strictly as a children's film, the movie is largely successful is creating a cute movie version of the classic book that is unlikely to terrify or bore. For some young one's, it might even be a yearly favorite until they are old enough to see "The Polar Express" or "A Christmas Story." Considering the other Christmas film in theaters families have to choose is Disney's "The Nutcracker and the Four Realms," I have to say "The Grinch" looks Oscar worthy in comparison. I guess I'm just wondering why we must return to this story in movie form, when a short subject would have much more of an impact, where Seuss's hand drawn artwork would pack more of a punch than the bean-counting budget animation this film sports? Also, to quote the Grinch itself, so many moments of this movie move so fast with so little purpose, the movie ends up being nothing but noise, noise, noise. Noise - in a children's film - is something I can't stand in the least. Parents, while there could technically be some "crude humor" in this, I don't think anyone's going to be offended by this. Recommended for all ages.